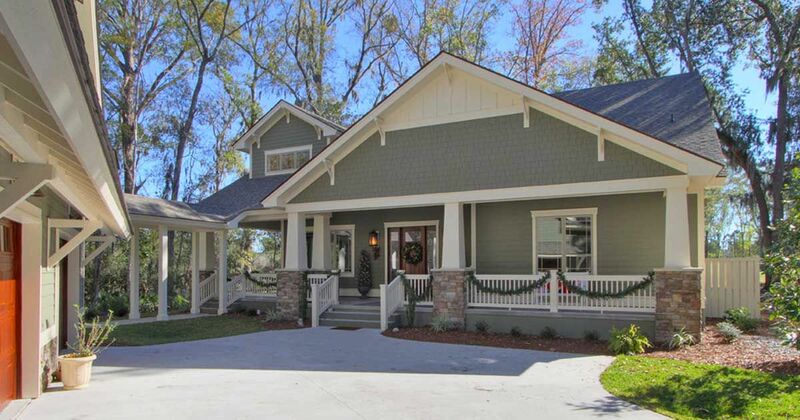 This beautiful Craftsman home, seen on Houzz, is undoubtedly charming. Located in Normandy and surrounded by beautiful trees, you know you'll enjoy some peace and quiet as soon as you arrive. But, while it appears quiet and unassuming on the outside, this house is absolutely stunning indoors. 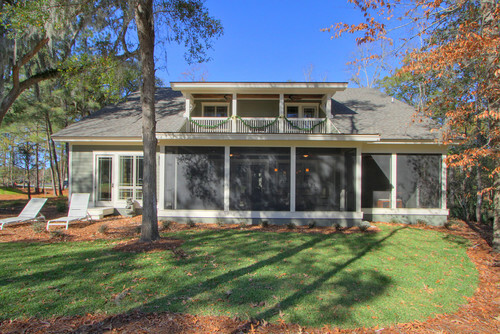 According to the builders, Reminiscent Homes, the custom 4,250 square feet dwelling offers an "open plan with custom cabinetry features and granite," they explain on Porch. Photo by Reminiscent Homes, LLC. When you walk indoors, you may be stunned to find the large modern-rustic kitchen. 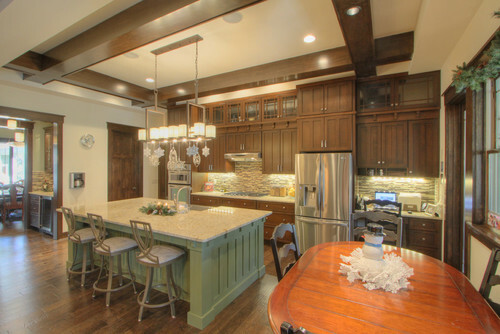 Complete with stainless steel appliances, stunning hardwood cupboards, and a large island, the kitchen is a dream. 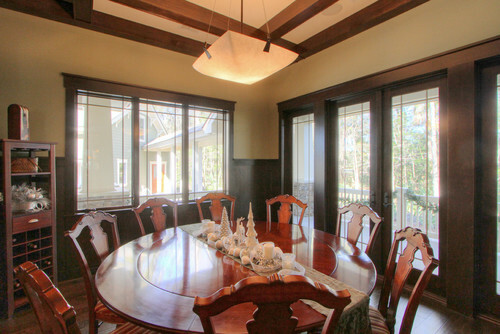 The dining space is big enough to fit a roomy table. Large corner windows bring plenty of natural light to the cozy space. 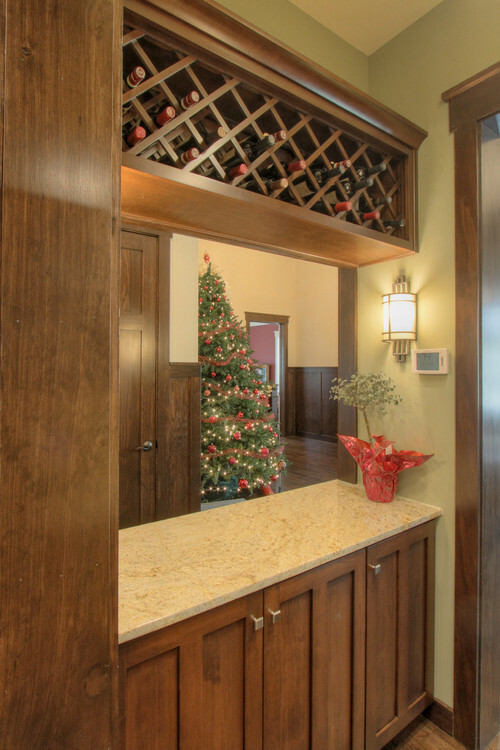 Tucked away is a stunning wine area complete with built-in shelves, drawers, and a wine cooler. The beautiful marble countertops add a touch of elegance. 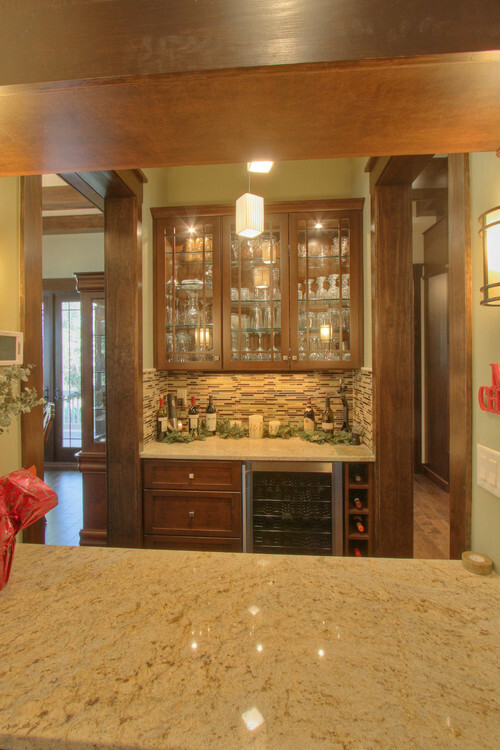 There is plenty of space for your favorite wines tucked up in the custom built wine rack. Store, snacks, cups and other items in the cupboards and turn this area into a mini-bar. The hardwood floors and finishes continue throughout the house, including this large living space. 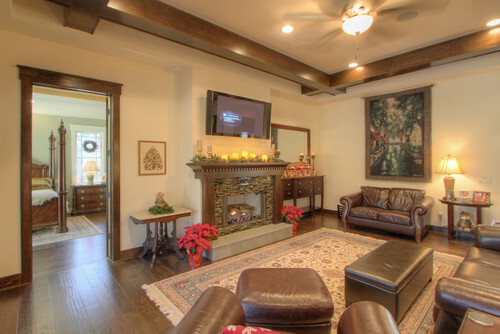 A beautiful fireplace is the focal point of the room. Imagine curling up with a cup of hot chocolate and a good book in this room! 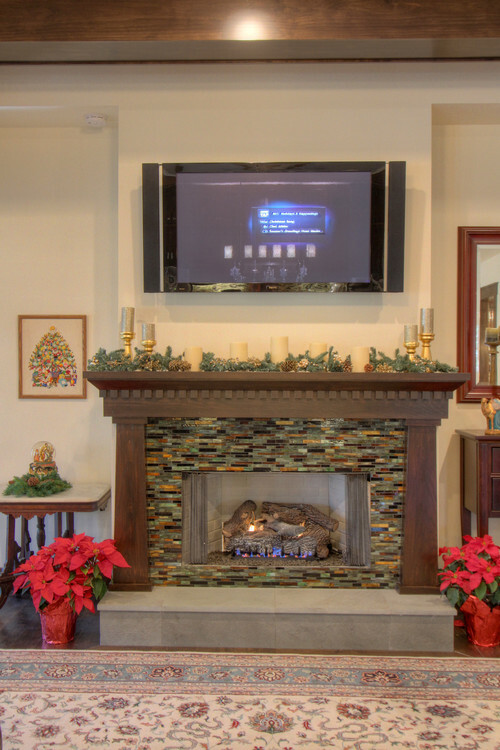 The stunning fireplace features a custom mantel and stone stoop. The open space between the kitchen, dining and living areas is perfect for entertaining family and friends during the holidays or all year long. 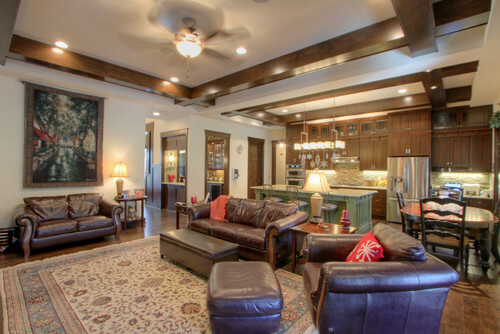 Detailed ceilings and hardwood floors allow the rooms to flow together naturally. The beautiful wood floors continue into the bedrooms. 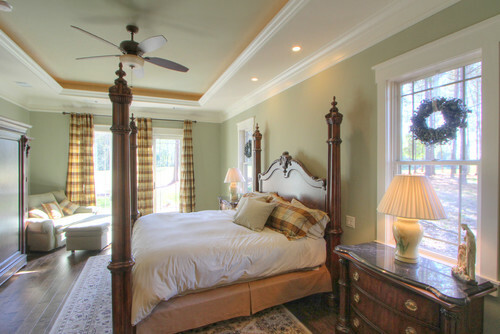 The ceilings here are more modern with recessed lighting and a lighter color to keep the room bright and comfortable. 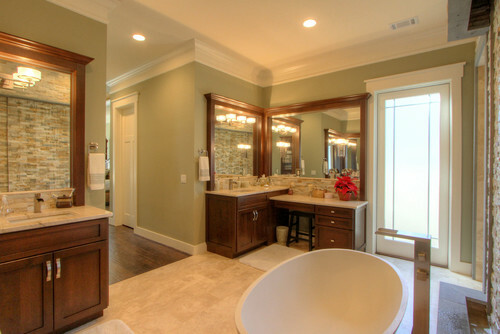 You have to step into the master bath to fully appreciate the home. 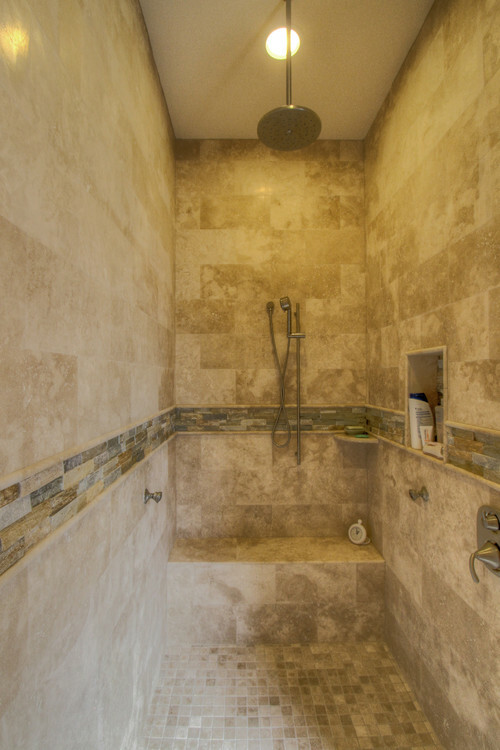 This beautiful oasis includes a stunning modern tub and walk-in shower. 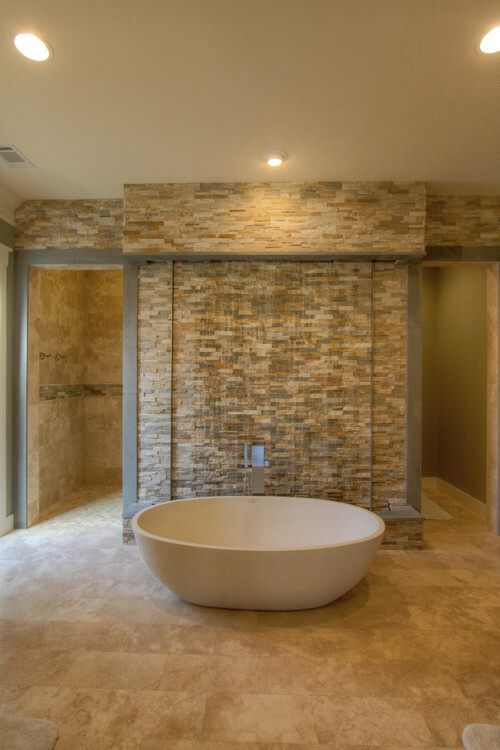 The stone in this room enhances the spa-like atmosphere and plenty of natural lighting is sure to make this a favorite spot in the home that deserved a 2013 Light House Awards for "Best Bath." His and hers vanities tucked away in the corners ensure the floor space feels large and open. Slip away into the stone shower after a long day at work and enjoy the modern shower head and relaxing atmosphere. If you're feeling a bit tired, you can sit down and enjoy the hot water while you wash up. 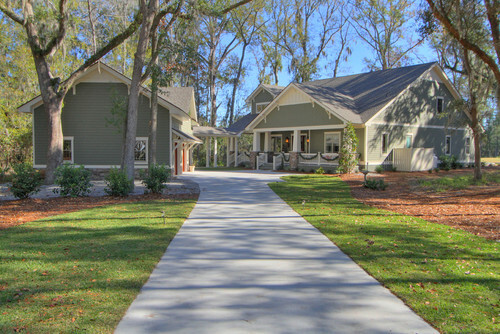 The charming craftsman home, set in an idyllic neighborhood, has plenty to offer. From beautiful outdoor space to a luxurious bathroom retreat, the beauty of this home is undeniable. Can you imagine yourself in this home? If you love the master bath as much as we do, make sure to share this with your friends on Facebook.